Miami, Florida is home to a number of different accredited schools that can provide you with the education that you need in performing ultrasounds and medical sonographs. Ultrasound technicians work with radiologists to obtain images and various organs within the body by using high-frequency sound waves. Education within ultrasound technology is available at three different levels including an Ultrasound Technology Certificate, an Associates degree in Ultrasound Technology and a Bachelors degree in Ultrasound Technology. Find Accredited Ultrasound Technician Schools in Miami, Florida Those interested in obtaining ultrasound certification within Miami, Florida, have five different schools to choose from. These five accredited technology schools within the city give you the option to obtain either a certification or associates and bachelors degrees. These schools include Dade Medical College in Miami, Barry University, ATI College of Health, Dade Medical College in Hialeah and Professional Training Centers. Many ultrasound professionals within the region are graduates of these technical centers and colleges. To find the perfect school for you, it is important to first determine what type of degrees you are interested in obtaining. Sonography is one of the many types of applications that can be used in ultrasounds. An ultrasound is the result of the imaging process of sonography. Those interested in obtaining education in sonography are able to attend the same colleges and institutes in Miami that also offer accredited ultrasound courses. This includes Dade Medical College in Miami, Barry University, ATI College of Health, Dade Medical College in Hialeah and Professional Training Centers. Salaries for sonographer in Miami, Florida may vary depending on your education, experience and where you are working. Typically, the average salary of a sonographer in Miami earns around $55,530 annually. 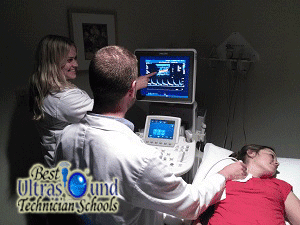 Those earning in the 75th percentile as an sonography tech may earn up to $66,000 per year.